Cars in the Bronx were squashed almost in half under the weight of a barrage of bricks raining down on a street Wednesday. 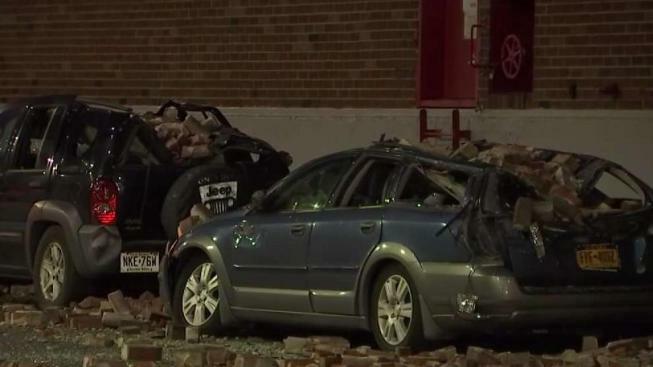 Hundreds of loose bricks littered a street on Walnut Avenue in Port Morris after they crashed to the ground from a warehouse at around 3 p.m., crushing an entire row of vehicles during a facade collapse, frightening neighbors. The Department of Buildings rushed to the scene and determined a 120 foot by 10 foot section of the parapet wall facade fell to the ground. More bricks were in danger of falling, which led police to block off the street. The DOB said at least five cars were damaged, and added the building is not in danger of collapsing. Nobody was hurt. “Thank God that nobody was hurt,” witness Kenny Blanco said. The owner of the building was issued a fine for failing to maintain the building.